"Diplomacy is often key, but not at the expense of advocacy - I've thrown many lefts and rights both in the courtroom and in life, and ultimately, the combination that gets my clients results is my tenacity and the fact that I care!" The Lento Law Firm was founded and is guided by attorney Joseph D. Lento, who has spent his professional career passionately advocating for his clients; bringing to the table nearly fifteen years' experience in the criminal defense and criminal justice fields. 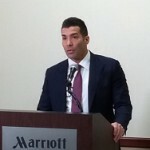 Moreover, as an attorney, Joseph Lento dedicated himself to ensuring clients' rights are protected, and he has spent nearly a decade representing clients charged with criminal offenses throughout Pennsylvania; including, but not limited to, Philadelphia, Montgomery, Delaware, Bucks, Chester, Berks, Lehigh, Lancaster, and Northampton County. Nothing is more important to Joseph D. Lento than family, and he advocates for his clients not only with this philosophy in mind, but also in his heart. Helping clients and their loved ones get through one of the most difficult times in their families' lives can be just as important as doing it what it takes to hear the judge or jury say, "Not guilty." Joseph D. Lento does not merely settle for the easiest outcome, and instead prioritizes you or your loved one's needs when it comes to securing the future. Well-versed in the effective use of diplomacy, he has successfully handled countless complex and sensitive negotiations where the stakes are always high. Joseph Lento will also not be intimidated in the face of the prosecution, or those with positions contrary to his clients. Ultimately, he will do whatever is necessary to ensure that your or your loved ones' goals and future prospects are not stifled because of a misunderstanding or unfortunate mistake. "Only the strong survive, and when you or your family is faced with a challenge in life, ask yourself, 'Who will be fighting for you? An attorney who has fought and won hard rounds? An attorney who, no matter how hard the fight, has the heart to answer the bell?' Success is often hard-fought – I wouldn't expect it to be any other way. I drive hard, I go the distance, and the results I get for my clients speak for themselves!"